Unispace is a global design firm that seamlessly unites strategy, design, project management and delivery to achieve real, measurable results for their clients. 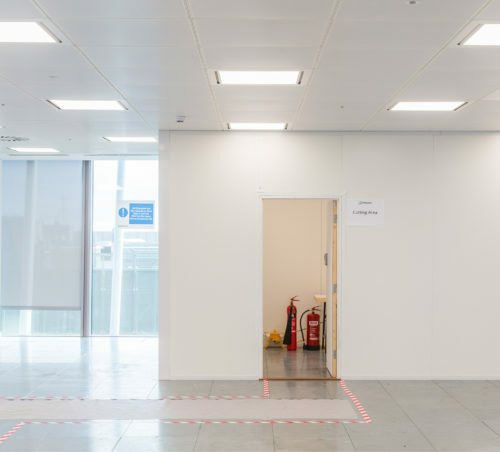 Having worked with Westgate before, Unispace approached Westgate to create internal temporary site rooms for a project they were working on at the iconic 20 Fenchurch Street in London. A key requirement for Unispace is that their project sites are all of a consistent signature quality, including that of the internal site rooms. By using Westgate’s Hoardfast temporary internal hoarding solution across multiple projects, Unispace can confidently maintain their standards. 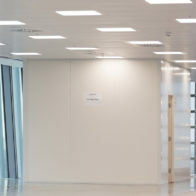 It was essential that the site rooms were suitable for a corporate environment, especially being in a high profile building such as ‘The Walkie-Talkie.’ Hoardfast PVC was used to form a site office with the modular design offering a quick, easy, clean and flexible installation. The lightweight Hoardfast PVC panels can be easily taken down, moved and reinstalled for phased works and are supplied ready to install, with no requirement for cutting and painting, which is proven to save fit out contractors valuable set-up time on site. Hoardfast Firescreen hoarding was also supplied to form a cutting area. Firescreen panels are 60-minute fire rated panels that adhere to the EN 13501-2:2008 (Surpasses Class 0) European standard. The panels are 80mm thick, white, steel faced with a mineral wool filling. Firescreen is ideal for a cutting area not only due to its fire rating, but also as it provides some additional acoustic properties to help screen any noisy processes. “During the preconstruction stages noise disturbance was the largest risk we identified at 20 Fenchurch Street. Creating an agile cutting room from Hoardfast has drastically reduced noise output”. 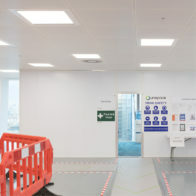 Both Hoardfast PVC and Hoardfast Firescreen were installed as a floor to ceiling application on this project, using floor and ceiling u-channels, which can be easily removed without damage. When this is not an option, Hoardfast systems can also be supplied freestanding. The project took 3 days from quote to installation with the client installing the hoarding themselves within 1 day.